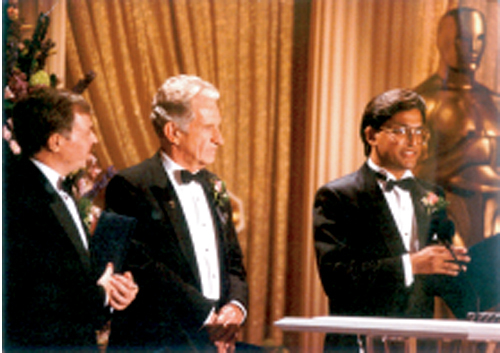 Nasir J. Zaidi accepting Technical Academy Award for the design and development of the Spectra Cinespot one-degree spotmeter. THE ACADEMY OF MOTION PICTURE ARTS & SCIENCES PRESENTED "THE TECHNICAL ACADEMY AWARD" TO NASIR ZAIDI, JIM BRANCH, WILLIAM BLOWERS AND SPECTRA CINE, INC. FOR THE DESIGN AND DEVELOPMENT OF THE SPECTRA CINESPOT ONE DEGREE SPOTMETER FOR MEASURING THE BRIGHTNESS OF MOTION PICTURE SCREENS. The Cinespot is a compact, hand-held meter for making accurate reflected luminance measurements. A one-degree area of a rectangular field, measured over twenty-one diagonal degrees, can be seen in a magnified view through the lens with a simultaneous read-out from .5 to 30 or 5 to 300 footlamberts. Brightness readings can also be used for exact lighting levels in production photography. The Technical Award was presented at the 61st Annual Scientific and Technical Academy Award ceremony hosted by Actress Angie Dickinson held at the Beverly hills hotel in Beverly Hills, California. Spectra meters are the industry standard and the choice of professionals for the past 50 years. Spectra products have received 5 Technical Academy Awards from the Academy of Motion Picture Arts and Sciences for Development and manufacture of technically superior products important to the Motion Picture Industry.